Newly refurbished luxury 2 bedroom apartment in quiet gated complex. 1 double bedroom, 1 twin bedroom, family bathroom with walk in shower. Fully equipped kitchen with washing machine, fridge/freezer, 4 ring electric hob and oven, kettle, toaster, microwave and crockery etc. Lounge/dining area with sofa bed, flat screen TV and air conditioning unit. Locking safe also included at no additional charge. Hairdryer, free standing clothes dryer, iron and ironing board. Towels and linen provided. Private Wi-Fi available, along with full European TV package. Glass sliding door lead out onto private gated terrace with comfortable seating area and parasol. 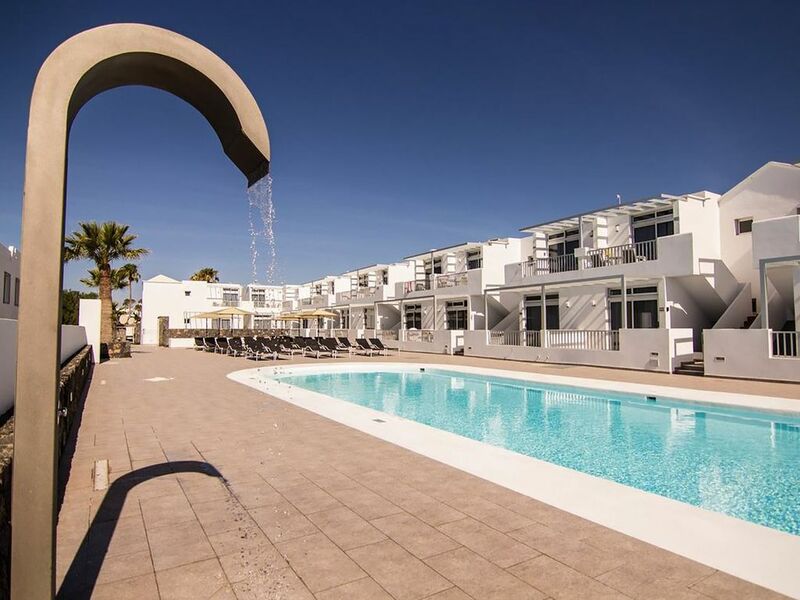 Communal heated swimming pool and separate children´s pool both set within a terraced area with sunbeds and parasols. The bar/restaurant in the complex is open from 9.30am until 8pm each day. The apartment is two mins walk to a large grocery store, five minute walk (on flat ground) to the beach and the main strip of Puerto Del Carmen. The apartment is located within a very short walking distance to local bars and restaurants. The apartment cleaning is included in the price. An additional mid-stay cleaning service (inc. linen and towel change) can be arranged for an extra fee of €40. If you prefer just a linen and towel change this can be arranged for an extra fee of €20. Pre-booking for both options is required. Payable in cash upon arrival. The Arrecife airport is only 10 minutes in a taxi. This apartment is ideal for couples or young families. Fully function kitchen with settings for 6 people. The apartment has everything you need, modern, clean and 2 nice bedrooms. Lovely pool area and lots of sunbeds. Its a 5 minute walk to front and very central for restaurants and bars, the sea front stretches for miles and is lovely. The apartment had a washing machine, which was very useful given we under packed beach wear and it was very hot! All in all apartment was excellent and would highly recommend. Not been to this resort for 25 years and it has changed dramatically in size but would love to go back. Thank you for making our holiday one to remember. Thanks for your kind review, we are so happy you enjoyed your stay. Yes the island is in constant change, we hope to welcome you back very soon. Wow, fantastic place to stay. We would definitely return. Definitely felt like 'home from home'. We loved the apartment, which was well placed for the short walk to the beach and strip. Would love to return. Thank you for your lovely review we are so happy you enjoyed your stay and look forward to your next stay with us. Location, cleanliness, friendliness and value for money all get top marks. Really lovely, well equipped apartment. Friendly and helpful bar staff. From booking to leaving everything went perfectly. I’ll definitely be booking again. Its great when people enjoy our place as much as we do, we look forward to welcoming you back again very soon. Appreciate the review and we look forward to welcoming you back very soon. We really enjoyed our stay. Lovely clean apartment on a great complex. Sadly for us the pool bar was closed but we were warned in advance by the owners. It didn't spoil our visit. A five minute walk from all the shops and bars on the sea front, and an easy walk to bus stops for trips to other parts of the island. Thank you, Mick & Anna. Its a shame the bar was closed which generally only happens for a week a year. Had a lovely stay at at los gracioseros. The apartment was lovely, spacious and clean. The beds were really comfortable. TV had every channel you could ask for. Mick was very helpful and when I left somethings behind he went out his way to get it back to me. The complex was lovely with a bar that served food. Great location with a short walk to bars and restaurants. I will definitely return. Its great to get a lovely review for our apartments, we are so happy you enjoyed your stay and look forward to welcoming you back very soon.